Treak Cliff Cavern has 3 species of cave bat living amongst the stalactites, stalagmites and Blue John stone along with a colony of European Cave spiders, called “Orbweavers”. Of the 3 species that share the caves with us, the Daubenton’s bat (Myotis Daubentonii) is our most common (pictured below) with the ‘Natterer’s’ (Myotis Nattereri) and smaller ‘Whiskered’ bat (Myotis Mystacinus) also in residence. 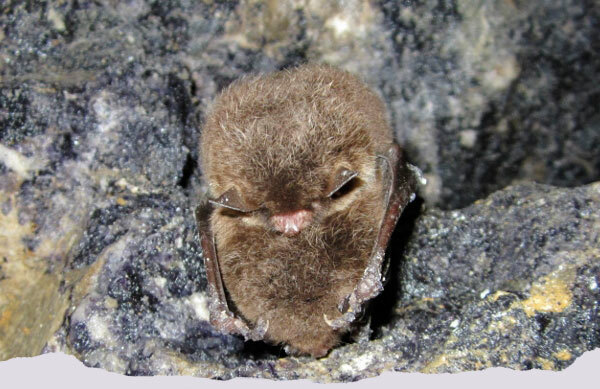 Many Daubenton’s bats hibernate in caves, mines and other underground sites, so it is perhaps not unusual to see them underground in Derbyshire. They generally stick to water where they like to feed on insects, even fishing them from the surface of pools, still water etc. Natterer’s bats have a similar appetite for insects but also like to feast on spiders, occasionally snatching them from their webs! The bats at Treak Cliff Cavern occasionally come in to roost away from the main public areas where they can rest undisturbed. If you are lucky you might see one fly past on your tour of the caves! Hidden in the cracks and dark recesses of Treak Cliff Cavern exit tunnel, are a colony of European Cave spiders, called ‘Orbweavers’ (Meta Menardi). These relatively large (for the UK) arachnids spin beautiful egg sacs for their young. They are thought to have a symbiotic relationship with our bats. Like many spiders, they are venomous but they pose little or no threat to large mammals (humans) and are slow moving and non-aggressive, although provoked may give you a ‘nasty nip’! They are known as ‘gentle giants’ of the UK spider population. The most common bat here in Treak Cliff Cavern, the Daubenton’s bat can grow between 45mm -55mm in length with a wingspan of 240mm – 275mm. 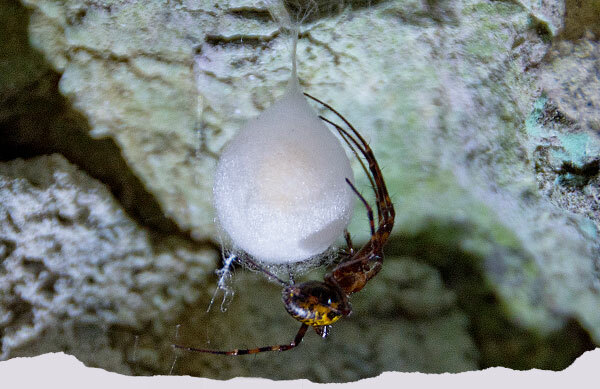 An orbweaver spider and an egg sac. It might look a bit menacing here but it is actually quite harmless!